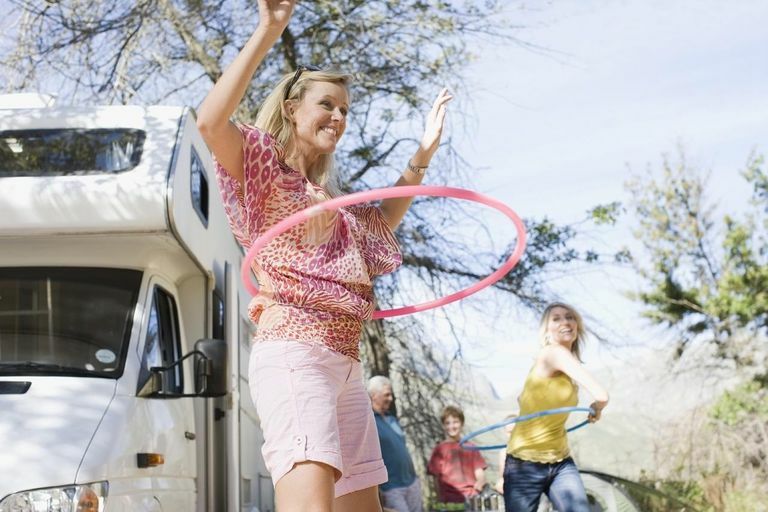 The hula hoop is an ancient invention — no modern company and no single inventor can claim that they invented the first hula hoop. In fact, the Ancient Greeks often used hooping as a form of exercise. Older hoops have been made from metal, bamboo, wood, grasses, and even vines. However, modern companies "re-invented" their own versions of the hula hoop using unusual materials, for example; plastic hula hoops with added bits of glitter and noisemakers, and hoops that are collapsible. Richard Knerr and Arthur "Spud" Melin founded the Wham-O company, which helped popularize another ancient toy, the frisbee. Knerr and Melin started the Wham-O company from their Los Angeles garage in 1948. The men were marketing a slingshot originally invented for training pet falcons and hawks (it slung meat at the birds). This slingshot was named "Wham-O" because of the sound it made when it hit the target. Wham-O also became the company's name. Wham-O has become the most successful manufacturer of hula hoops in modern times. They trademarked the name Hula Hoop® and started manufacturing the toy out of the new plastic Marlex in 1958. On May 13, 1959, Arthur Melin applied for a patent for his version of the hula hoop. He received U.S. Patent Number 3,079,728 on March 5, 1963, for a Hoop Toy. Twenty million Wham-O hula hoops sold for $1.98 in the first six months. On June 4, 2005, Australian Kareena Oates set a Guinness world record for hula hooping — with 100 hoops for three full revolutions.